I once posted about things I'd prefer not to experience while living on a boat. Unfortunately we had one (or two) of those experiences occur recently. This past weekend we noticed a discoloration on our salon carpet (19 year old indoor/outdoor stuff that's still in pretty good condition) and immediately blamed the dog (don't tell me pets don't serve a purpose on a boat). Poor Wilbur, we said, he must have puked and cleaned it up by himself. And as we bent over the spot and squinted at it, Wilbur got into the act and gave it a good sniff too so as to throw us off the trail because surely a guilty dog would absent himself from such evidence. I assured Hans I'd clean it; someday; and we went about our business. The next day I noticed the 'spot' was still moist but decided to ignore it. Let me interject here that we've lived through more rain this past week than we ever have since moving aboard three years ago. Tropical Storm Debby dumped tons of water on us but she ditched us after a couple of days. Same thing for some other storms. But this week we've been dumped on every night and as we watch water gush through the parking lot and cascade over the sea wall, we've dubbed our marina, Pasadena Falls. 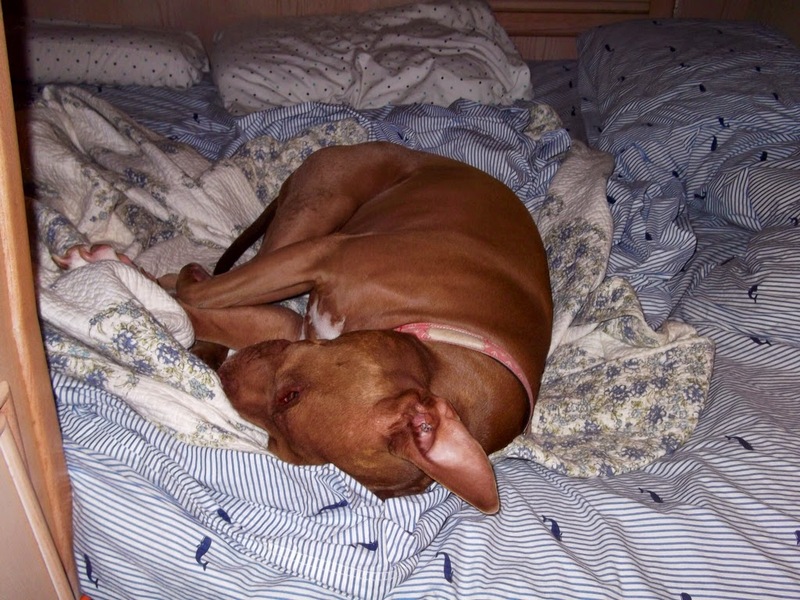 The next night I stole Wilbur's spot on the settee since he was sleeping in our berth ('sensible pitties know it's bedtime', we laugh everytime he thumps and bumps his way down below) and was enjoying the fact that I could lounge about with my feet up. Then I stood up to get a drink and 'Yuck'! my feet sank into waterlogged carpeting. What the hell? We immediately looked up at our hatches (because where else would water come in from?) and they were dry. I got down on my hands and knees (something I should have done when I thought Wilbur puked) and oh my god! water was everywhere. It was actually pooling between the salon and galley area. There's nothing like a boat full of water to get one going, and we were moving. Hans immediately checked our bilges but they were dry and full of cobwebs. 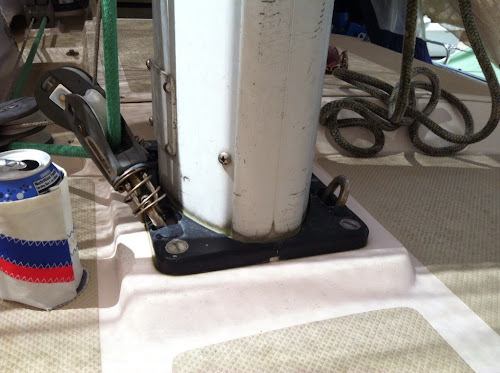 As I felt about the carpet with my hands I realized it was especially soupy around our compression post (this post is the inside support for our mast, much like a support post in a house) which strongly resembles a dance pole. After drilling out the screws that hold the carpet in place I lifted a couple of planks from the base of the pole and found a space we'd never seen before. It contained a small well, and it was full of wires. And water. A few years ago our electrician did some work in this area but when he started digging into the guts of the Knotty Cat I knew I wanted to watch this perhaps as much as I might want to observe surgery, and so I went shopping for provisions. But now I had no idea what to do and couldn't imagine where this water was coming from as the ceiling above was completely dry. I dug out the shop-vac I'd used to vacuum a few days earlier which of course was full of dog hair and dust, and therefore needed to be emptied and cleaned first. Out into the cockpit (in my nighty) I went, where the wind was slashing water sideways and most of the dust and dog hair ended up stuck to me instead of in the garbage bag. With the carpet pulled back you can see all the wires (and a washcloth jammed into the lower corner) sitting in a shallow well. Off to the right is a conduit where those wires continue on under the boat and it was completely full of water. This had been slowly overflowing for a couple of days and since we didn't know it, we blamed Wilbur. I sucked over a gallon of water from here which included the water that had entered through the conduit that continued under the boat. After sucking up a ton of water we could see new water flowing into the well and finally realized the water had to be coming down through the compression post. The rain had slowed down and the best we could do until the next morning was to stuff the well with paper towels and a wash cloth. 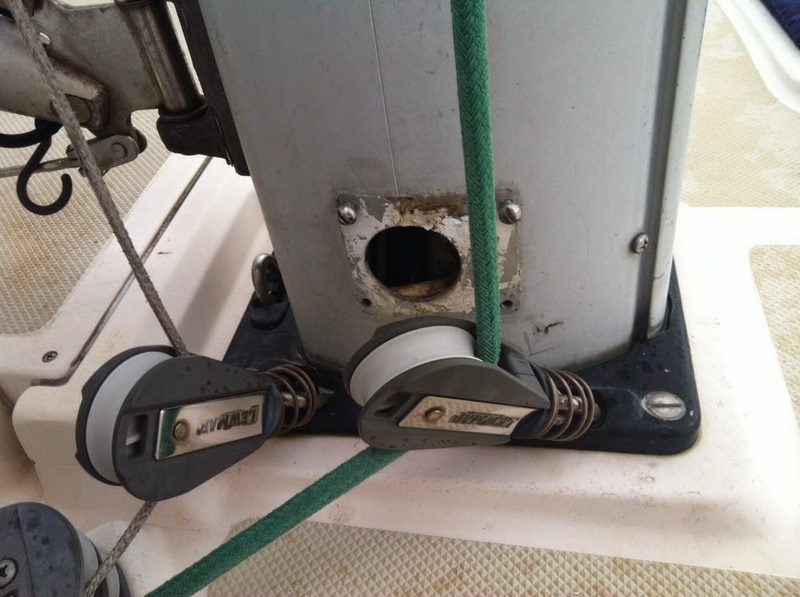 The next day I inspected the mast and about 6 feet off the deck I discovered that a rubber seal on the opening to the mast that our main halyard exits is starting to fall apart. Aha! 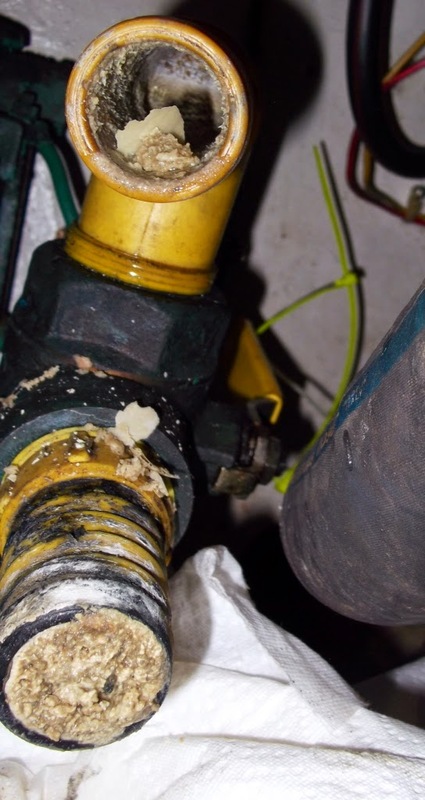 I was sure I'd found the problem but just to be sure, I sprayed our hose all over the base of the mast and when nothing leaked through I was very happy. And after I sprayed the halyard opening and water gushed down the compression post into the boat, I thought I was brilliant. I immediately stuck a piece of duct tape over the opening and announced to Hans that until we got a new seal we were just peachy keen. And then that night it rained buckets, and we watched the well under the compression post fill with water. Again. I spent yesterday googling like a crazy woman and learned new 'boat' words like baffle (oh, I was baffled all right) and weep hole (I wanted to weep but was too damn mad). So for future reference for anyone else who experiences this problem with a boat, this is what I learned. We have a deck stepped mast (I can't help you with a keel stepped mast). 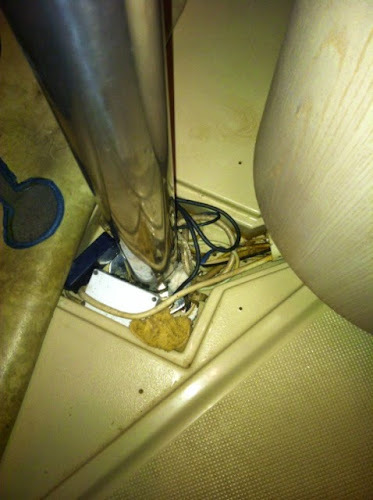 This means the mast sits atop the boat and a compression post supports it from inside the boat. The deck is sandwiched in between. Inside the mast, conduits run from the top to the bottom and these conduits carry all kinds of wiring; radar, vhf, anchor light, steaming lights etc... They then feed into another conduit that enters the compression post inside the boat where all those wires exit through the bottom and go their merry way to wherever it is boat wires go. Since the mast has several openings for halyards, electric wires, etc... water is obviously going to get in, but how does it get out? This is something I never even thought about until the other night. I found out that the mast is supposed to have a 'weep' hole at the bottom. I went out and crawled all around the mast but for the life of me I couldn't find one. I asked for help on a couple of forums and called Island Packet. IP referred me to a couple of boat yards that are familiar with this model but until they called back I kept searching. The forums were very informative and I appreciated their help but I still couldn't find the hole. On our ice run/dog walk we ran into Mike, one of our neighbors, and he offered to come and take a look. Luckily he knew exactly what I was talking about. The base of the mast. I couldn't find a drainage hole and I wondered what that screw (off set on the left side) was for. I thought maybe someone at a boat yard had plugged it up. Mike took one look and said he was sure that the tiny rectangular opening at the very bottom of the black part was our weep hole. I just thought a hunk had been broken off over the years. I had been inspecting the mast only. So now that we found what we thought was the weep hole, we discovered it was completely blocked with sealant. We spent a bit of time poking at it with a Swiss Army knife and one of my BBQ skewers but got no where. Aha! Mike asked why we didn't just take the 'inspection plate' off. So we did. I did find that the screw on the mast (off to the right in this picture) I had been wondering about, holds a conduit in place that runs down the mast. I was very hesitant to touch any of the screws until someone actually confirmed to me that it would be okay. 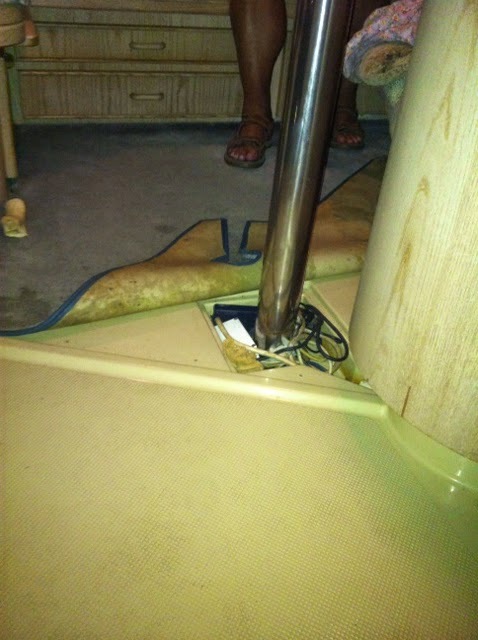 So when Mike told us an inspection plate is just that; a place to inspect the mast, we opened it up. 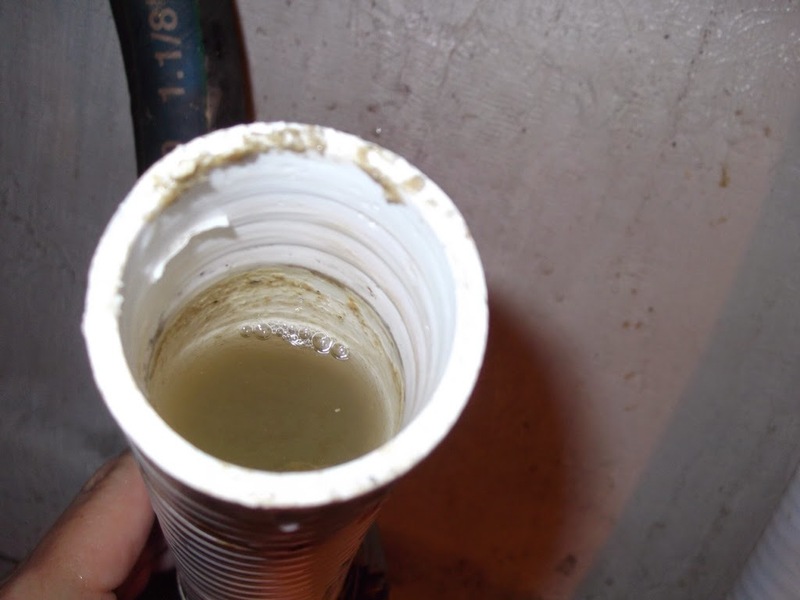 We had no sooner loosened the bottom screw than water started trickling out. Once it was open we saw that the water was up to the bottom of the hole. Out came the shop-vac again. Now that the mast was empty we got a good look inside. The conduit that runs down into the compression post sticks up about 4 inches and once the water in the mast rose higher than that, it of course, ran down into the boat. Needless to say if it had drained properly this never would have happened. What I hate knowing is, water has most likely been sitting in the mast and never fully drying out for a long time. My first line of attack is going to be trying to clean out that hole. However, I've already tried and it feels suspiciously like 5200. If that doesn't work we're going to drill a small hole as close to the base of the mast as we can. This is what several people have recommended. I'm pretty sure that makes more sense than Hans' idea which was to drill hole in the compression post well and out the bottom of the boat. Really. I would bet there are a lot of people out there who are either highly entertained by our antics (as in 'Did you hear what those idiots did this week? You won't believe it! ), or wonder how the hell we survive on a boat. I sometimes wonder myself. ...For Life; and I dare anyone to take that one small and smelly accomplishment away from me. The fact that it's all my fault is beside the point. All those white hoses belong to the Knotty Cat's 'septic system', and what a joy they are to work with. NOT! Honestly, I never thought that only two years after replacing most of the hoses to our head that I'd be right back at ground zero. First of all, I have to tell you, I've revised this particular post so many times during the past week I've literally lost count. 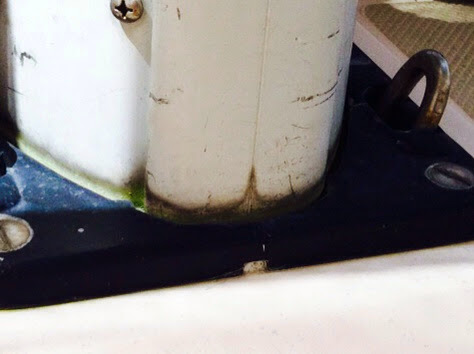 Initially, when we first noticed that the head we use most often (the one adjacent to our berth) wasn't flushing in the same friendly manner we'd become accustomed to, I was puzzled. You see, in May when we yanked our holding tank out of its new home (we needed access to the space beneath it), the hose that fed into it was perfectly clear. And don't think I wasn't feeling just a bit smug. 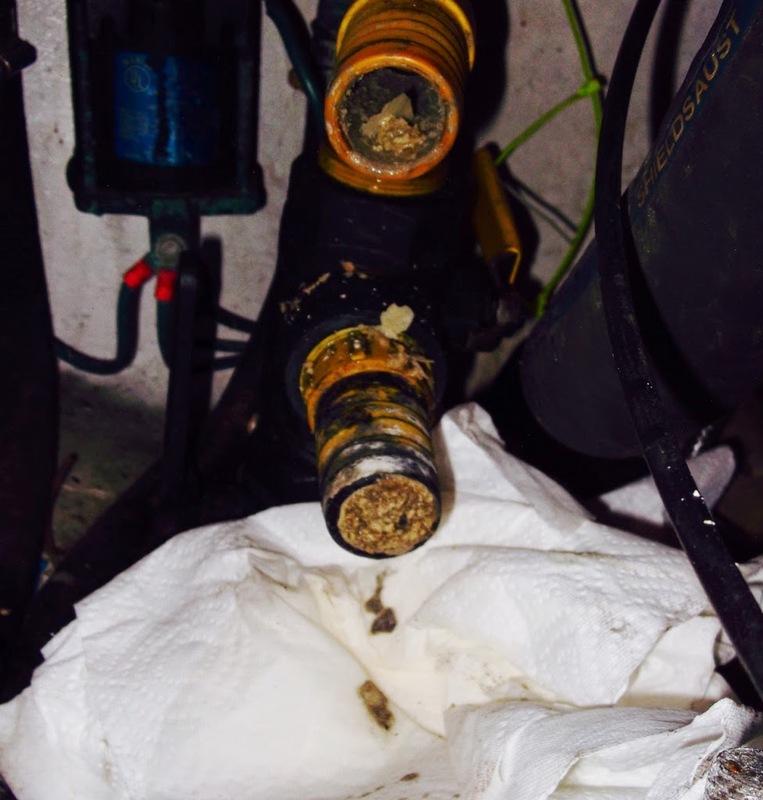 "I bet we have years before we need to worry about replacing these hoses again." I stated. Four months later, while everyone else was enjoying their Labor Day Weekend, I was eating (and smelling) my words because once again I was at work in the bowels of the Knotty Cat. As a lifelong fan of Nancy Drew and Agatha Christie, I dearly love a mystery, but I'm pretty sure Nancy never had stinky potty water spew over her feet, and Agatha used much prettier smelling poisons than the odors emanating from our hoses. This much I knew; either there was a huge blockage in the hose I thought was the culprit, or else the Joker Valve (who comes up with these names?) 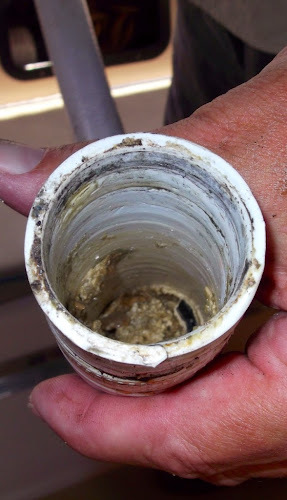 right beside the toilet was coated with calcium deposits. Well, bless my stupid soul; it was neither one. In the end, I tried to use the process of elimination (honest to god, I should give a prize to the person who can point out all of the unintended puns I've interjected in this post), and just like I did two years ago, I wasted too many days trying to clear hoses, when instead, I should have concentrated on replacing them from the get go. This time around I decided to forego using muriatic acid (which scares the crap out of me) and opted instead for a mixture of vinegar and lemon juice (which, I find, cleans stainless fixtures better than any leading cleanser on the market). Labor Day weekend rolled around and eager to spend some time at the pool, I reconnected the one hose I'd focused on, bolted everthing back in place, threw the lever on our salt water intake, and bending over the toilet so I could see if water was leaving the bowl, I pumped the flush lever like crazy. For a few wonderful seconds I thought I was home free and then I felt that damn 'spongy' resistance you get with a blockage.... and WHAM! the toilet retaliated by erupting like a volcano. Directly in my face. How I didn't get whiplash I'll never know and I swear it was like I'd channelled the Seinfeld episode The Pothole . I guess I should be happy Hans will still kiss me. So on Monday afternoon after a full week of messing around, we finally finished installing new hoses and once again I bolted and clamped everthing in place. I poured some fresh water into the toilet bowl and even without a drum roll I felt very dramatic when I started pumping the handle (although I leaned away this time). And; SUCCESS!! I was so happy I kept repeating the process of dumping cups of water in just so I could flush without any resistance or volcanic eruptions. Even Wilbur did a little happy dance. Lesson learned. Fresh water flushing from now on. Poor Wilbur didn't know what to think about the whole thing. While I was working in the engine room Wilbur would lie on the floor in the doorway to the head, and when that got old he'd climb into our berth and nap. That way he could still keep an eye on me. 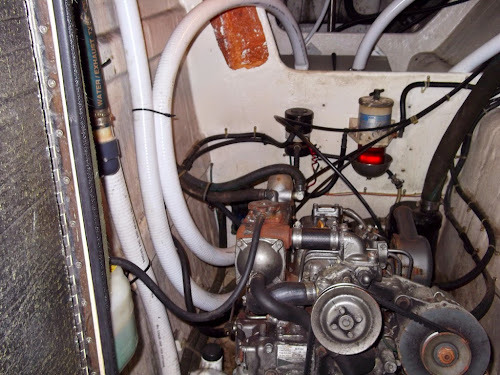 Actually I should add here that when I say all hoses have been replaced, I'm talking about the head on our starboard side. This is the one we use the most. The port side head is another story. 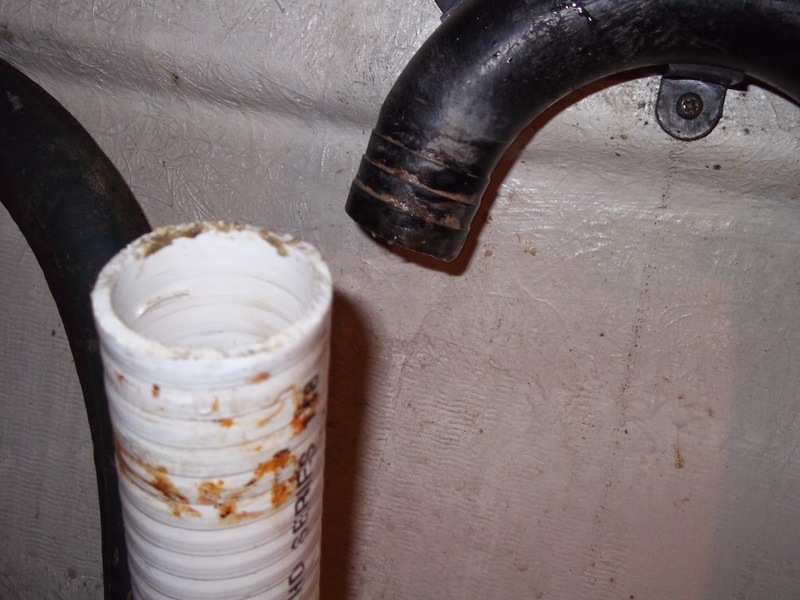 It's the one we used while ours was incommunicado and there are two major hoses I haven't replaced yet. Why? Because I just don't want to. They're heavy black hoses, they stink, and one of them goes behind the shower wall and will need to be 'fished' through. 'If it ain't broke don't fix it' is my motto, and I keep my blinders firmly in place. But right after we pronounced our head to be cured of its ills, we peeked at the hoses on the port side and once again I said let's leave them be. 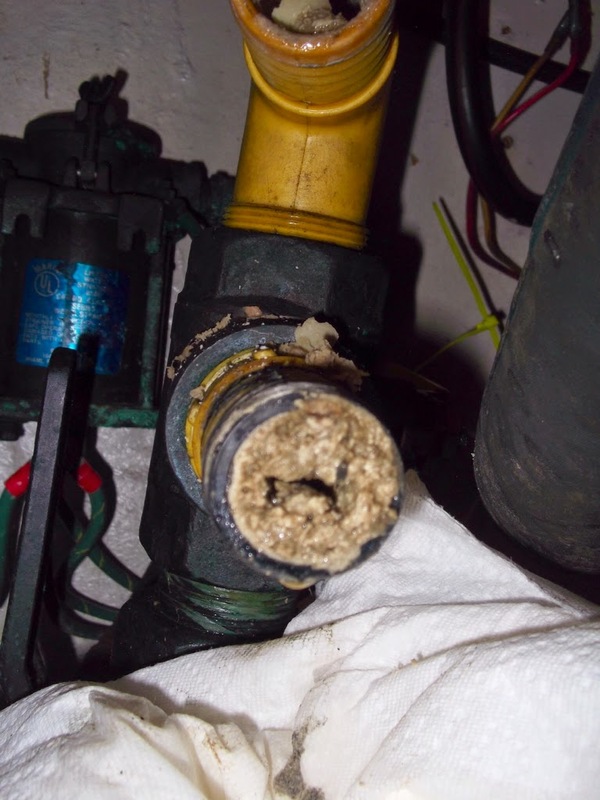 Just as I was closing the door I noticed something though; a spongy bulge right at the top of a hose and directly under a hose clamp. An aneurysm. In a toilet hose. I can't even imagine the nightmare mess we'd have if that thing blows. I guess Dr. Laura's job is never done.